Spring UP to Clean UP Launch a Huge Success! Spring is here! 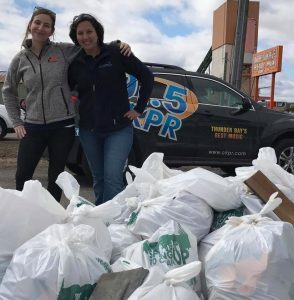 Time to Spring Up for a litter-free Thunder Bay! 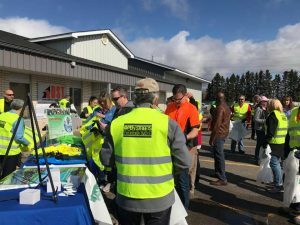 Thursday, May 4th was the official launch of the City of Thunder Bay’s annual Spring Up to Clean Up campaign. The City of Thunder Bay has sponsored this community-wide litter clean-up in partnership with EcoSuperior since 1996. Over the years, the program has grown to more than 10,000 participants annually working to beautify over 200 areas of our community. This May will be the 21st annual Spring Up to Clean Up and the program is continuing to grow, welcoming new partners, participants and sponsors and providing more events for the community to take part in. Pride in our community is increasing. We are seeing more and more people wanting to get out and help make Thunder Bay a more beautiful place to live. We are ready to harness that energy this spring and to support those helping to create a clean, green and beautiful Thunder Bay. To kick things off, nearly 100 businesses and offices are taking part in Thunder the 20-Minute Makeover event. Staff and management at workplaces all over town are stepping outside throughout the day for 20 minutes to clean up litter from around their neighbourhoods. Registered workplaces received Spring Up garbage bags, public recognition and a token of appreciation from contributing sponsors Bay Village Coffee, Upshot Coffeehouse and the Whole Nine Yards. At the launch event hosted by DST Consulting Engineers Inc., there were words of encouragement by Councillor Rebecca Johnson, Jason Sherband (City of Thunder Bay, Manager – Solid Waste and Recycling Services), and Shannon Costigan (EcoSuperior, Spring Up Coordinator). 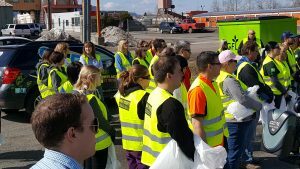 At 10:30 a.m., the 20-Minute Makeover was kicked off when businesses in the Hewitson neighbourhood came together annual litter clean-up. DST Consulting Engineers Inc. has been a long time participant in the Spring Up to Clean Up campaign. Spring Up to Clean Up is a community program is funded by the City of Thunder Bay and delivered by EcoSuperior Environmental Programs. Sponsored by the City of Thunder Bay Infrastructure and Operations, Ontario Power Generation, Thunder Bay Ventures, SPI Health and Safety, DST Consulting Engineers, GFL, Sleeping Giant Brewing Company, Bay Village Coffee, Upshot Coffeehouse, Creekside Nursery, Belluz Farms, Thunder Bay Border Cats, The Whole Nine Yards, The Purple Camel and Boston Pizza.